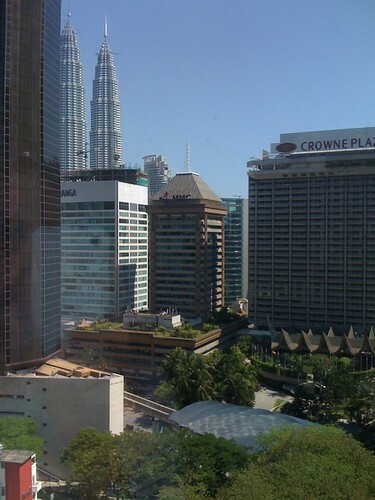 Just came back this evening from our (brief) trip to KL, as evidenced from the view from our hotel window above! I lived here in 2007-08 so it was good to go to all my old haunts. Will be posting proper photos and whatnot later this week. We've got Tuesday in Singapore (going to make the most of it), then 09:00 on Wednesday morning I'm back to Adelaide to face those "people" at that university. Can't wait. With that in mind they're will probably be a further interruption to your regularly scheduled blog posts here. If you feel the urge to read more Ruben sanctioned nonsense, feel free to browse the archive or barring that visit any of the fine folks on the site sidebar. They're far more interesting, succinct, eloquent and funny than me anyway. Danke schön, see you on the other side ^_^.